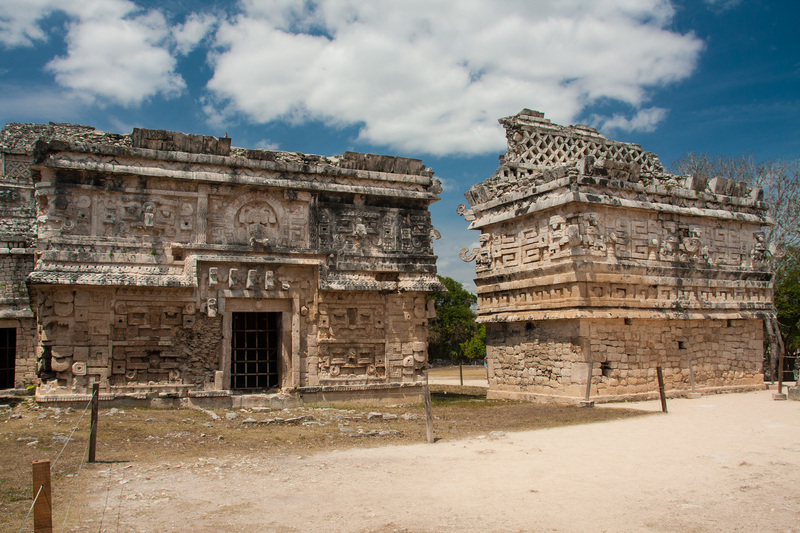 This post is part 2 of 4 of a suggested itinerary through Northern Yucatan, Mexico. If you missed it, be sure to read the Overview (part 1) first. Fly into Cancun. Try to schedule an early or mid-day flight in order to get a inland-bound bus once you arrive in Cancun. When traveling out of Cancun to other parts of the Yucatan, be aware that there are two Cancun destinations: the hotel zone and downtown Cancun. The former is the resort area, built entirely around the tourist industry. The hotel zone may be a great place to relax, but you definitely won’t experience true Mexico. You’ll want to catch a bus from the airport to the downtown if you plan to travel to destinations beyond. The airport bus station is just outside the domestic terminal, past the Air Margaritaville hut (you can’t miss it). Tickets can be purchased from the ADO representative at a podium in the station area. Ask the ADO representative to give you the price in dollars, unless you happen to have Pesos on you. The bus from the airport will deposit you in downtown Cancun at the bus station. Before you purchase tickets to your next destination, however, you’ll want to change your money into Mexican Pesos. While there are money exchanges just across the street from the bus station, you’ll get a better rate from one of several banks just down the street. Once you’ve changed money, head back to the bus station and purchase the appropriate number of tickets to Valladolid (pronounced “bah-yah-doh-leed“), a small town about 2 hours inland and a great place from which to explore Chichen Itza. Bus tickets to Valladolid cost around $14 per person. A colonial-styled street in Valladolid. 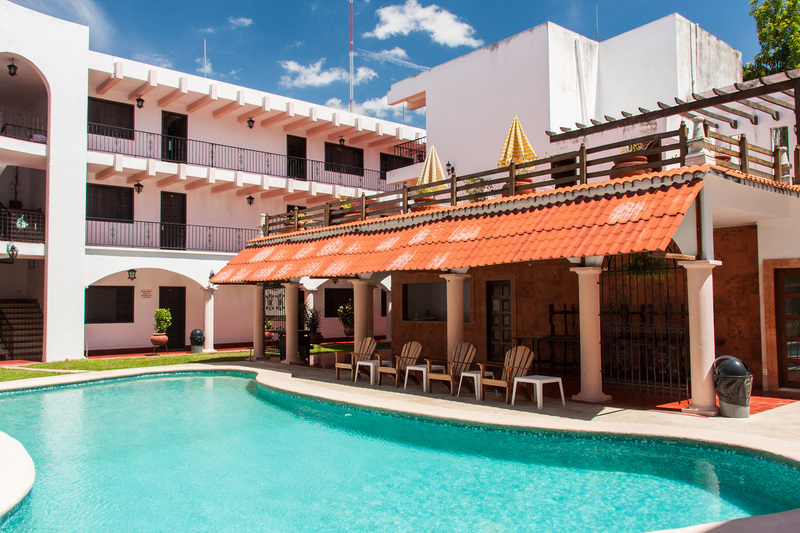 In Valladolid we recommend the Hotel Zaci – a quiet, comfortable, budget-friendly hotel just around the corner from the bus station. The hotel is only a block away from the Zocalo (main square), which contains a quiet park surrounded by several delicious restaurants. Hotel Zaci, Valladolid. Read our review of the Hotel Zaci on TripAdvisor.com. Chichen Itza is a 40-minute bus ride from the ADO station in Valladolid. A round trip ticket costs around $5.50. The pyramid of El Castillo (also known as the Temple of Kukulkan) is the most recognizable structure in Chichen Itza. Chichen Itza is one of those “must see” destinations. It’s the largest and most famous of the pre-Columbian Maya archaeological sites in the Yucatan Peninsula, as well as a UNESCO World Heritage Site. Many tourists visit Chichen Itza every day, so arriving early can give you a head start before all the tourist buses arrive from Cancun. An early start also helps you avoid the intense mid-day heat. 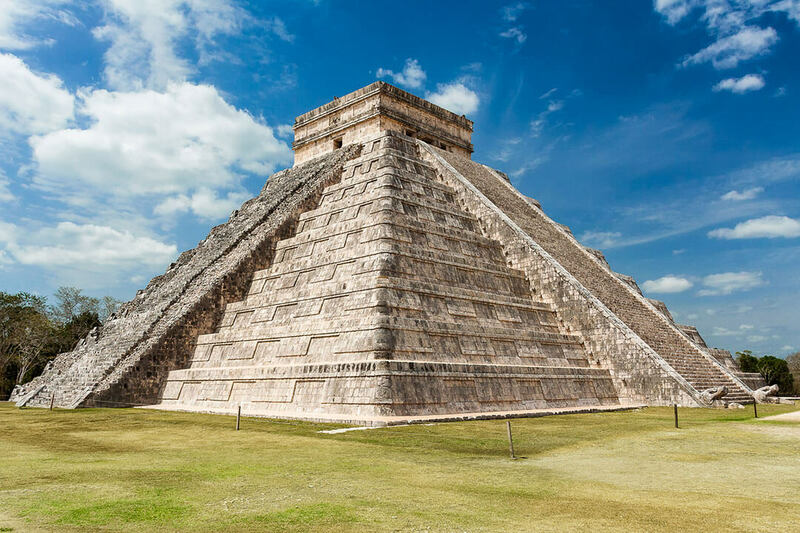 During the Spring and Autumn equinoxes, hoards of visitors flock to Chichen Itza to witness an optical illusion on the face of El Castillo, the large, central pyramid. The setting sun casts serpent-like shadows on the stairs, which appear to slither down the pyramid as the sun drops in the horizon. The effect is more conceptual than visual, and it might not be worth dealing with the larger crowds. Chichen Itza is located in the Quintana Roo state of Mexico, which means that you’ll have to pay two fees to enter: an entry ticket and tourist tax. Each of these fees must be paid at separate windows and you’ll be required to show both ticket receipts in order to enter the archeological park. The total cost per person is just under $10. 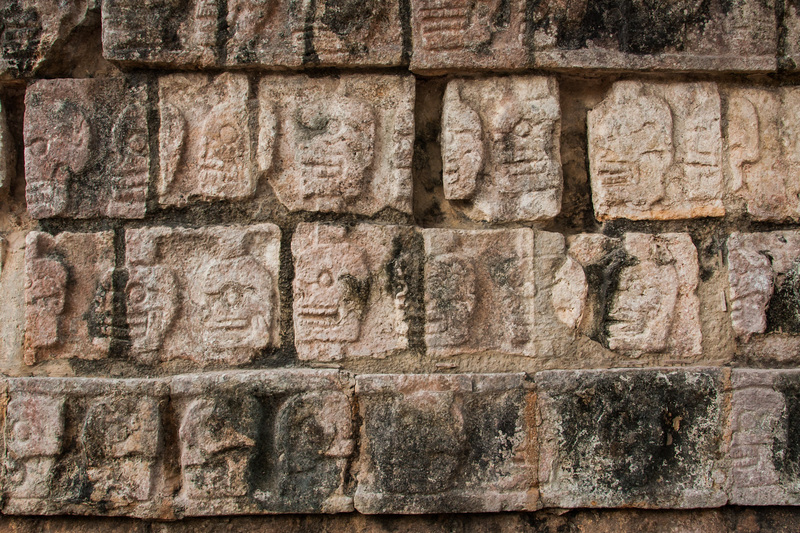 The Temple of the Skulls has rows of skulls carved into the base of the edifice. As far as archaeological parks go, Chichen Itza is large. Some people choose to hire a guide at the entrance to introduce them to the various structures throughout the park. Any decent guidebook, however, will have pages and pages of information dedicated to Chichen Itza, so a guide isn’t a necessity, in our opinion. Rather than carrying around a heavy guide book, photocopy the pages pertaining to Chichen Itza ahead of time to aid you in your visit. An alternative is to take pictures of the guidebook pages using your phone camera, which you can then pull up and refer to later. Chichen Itza is a sizable archeological park. Depending on your pace, you may spend an entire day (or perhaps several days) in order to be satisfied. (There are several luxury hotels near the archaeological park or more budget-friendly options in the nearby town of Pisté). More aggressive adventurers may be finished in 4-5 hours. There are several dining options at Chichen Itza, although the food is very average for the price. You are allowed to bring food into the park, so purchasing a lunch beforehand and eating it on the grounds can save time and money. You’ll find many locals selling their wares and handicrafts throughout the park. They can be a bit persistent when they see you checking out their goods, but most of them are polite enough if you indicate that you’re not buying. Many of the souvenirs in Chichen Itza are overpriced and can be found at much more reasonable prices elsewhere. 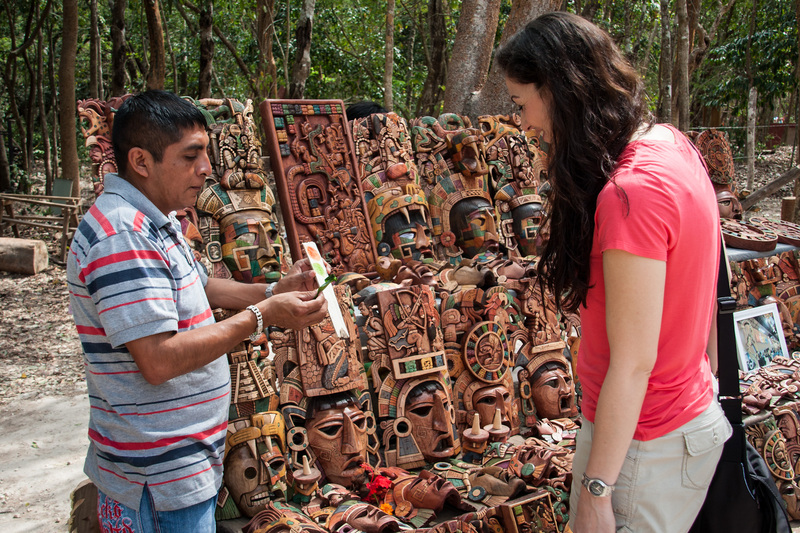 Whether you’re shopping for souvenirs or not, be sure to spend time chatting with the Mayan mask makers. They’ll show you how they carve the masks from cedar wood and stain them with natural plants to give them their coloring. A demonstration of the natural coloring used to decorate the carved Mayan masks. Once you finish up at Chichen Itza (or if the heat becomes too intense), head back to Valladolid for some rest or exploration. Valladolid has some interesting things to see and do, including the Calzada de los Frailes, a street consisting of colonial homes with great architecture; the Franciscan monastery of San Bernardino de Siena is a 15th century ex-convent and church is situated around a tranquil public park; and the Museo de San Roque is a museum near the central plaza that contains Maya and colonial artifacts. 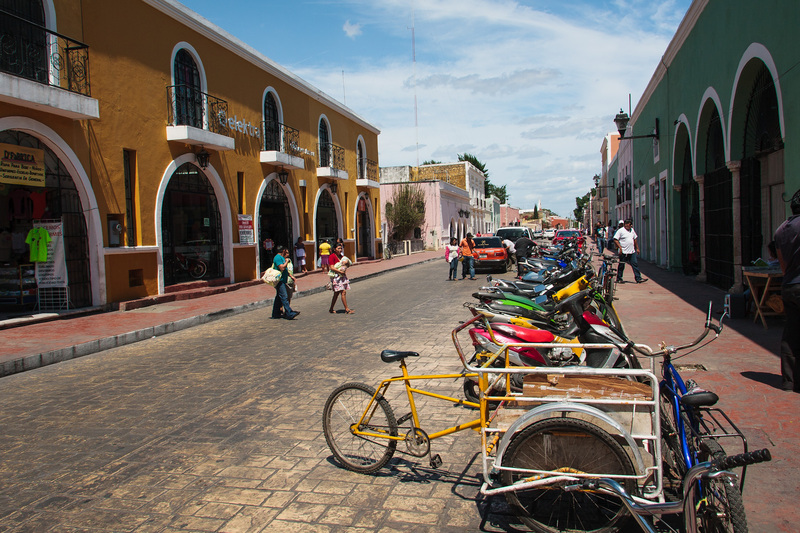 The people in Valladolid are informal and friendly, which makes it a pleasant place to explore. In the center of Valladolid is Cenote Zací, a large and fairly secluded sinkhole just a short walk from the central plaza at the intersection of calles 39 and 36. 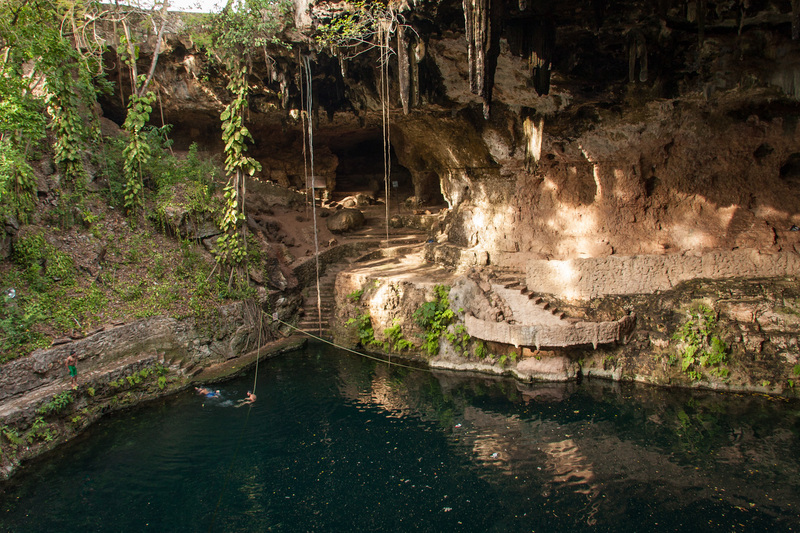 Tourists busses are known to visit the cenote, but they leave as quickly as they come. Most of the time you can expect to have the place to yourselves. The water in the cenote is very clean crystal clear; you can see the fish nibbling at your toes while you are swimming. The cenote’s partially open roof creates a cool, peaceful atmosphere. There is another cenote, the beautiful Dzitnup (also known as X’keken) about 2.5 miles (4km) west of Valladolid off Highway 180. It’s a bit more popular and is completely enclosed. Additionally, Cenote Sammula is just outside of town to the south west. It’s not as large or developed as Dzitnup, but it is beautiful and less crowded. We ran into Wandering Earl at our hotel and Sammula was the cenote he recommended, but we chose Zací because we had very little time before sunset it was an easy walk from the hotel. There are several restaurants around the central plaza. 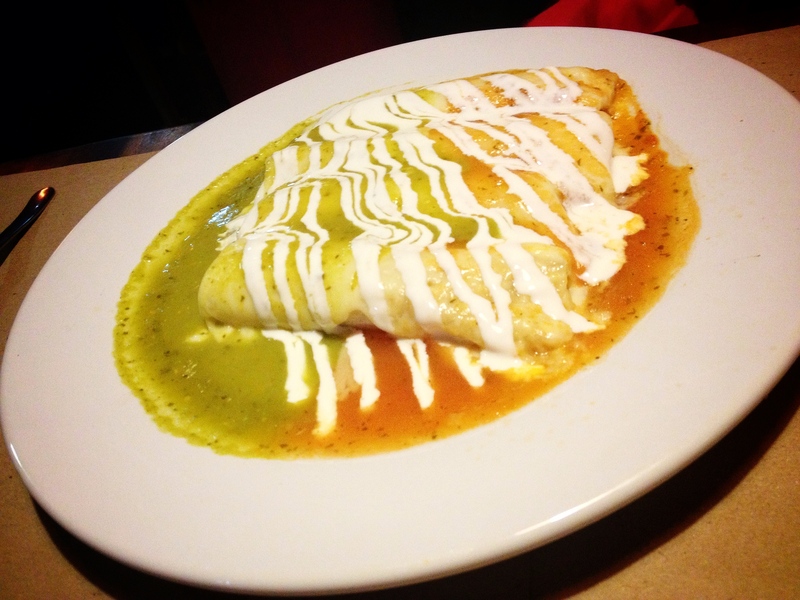 You can’t go wrong dining at La Restaurante Cantina, a lively and colorful restaurant with delicious food. After dinner, be sure to purchase a churro dessert from the vendor in the square for dessert. 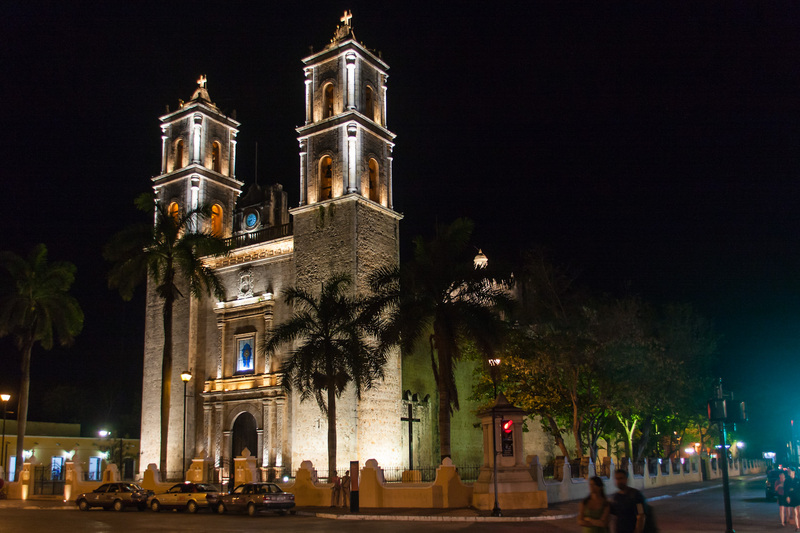 Sit in the park, enjoy your churro, and soak in the cool night air as you enjoy a view of the Cathedral of San Gervasio.